Film instructor Thomas Hering gives a few editing tips to Joshua Callendine and Evan Maus, students who participated in the 2018 Summer Enrichment Academy Friday at Dempsey Middle School. 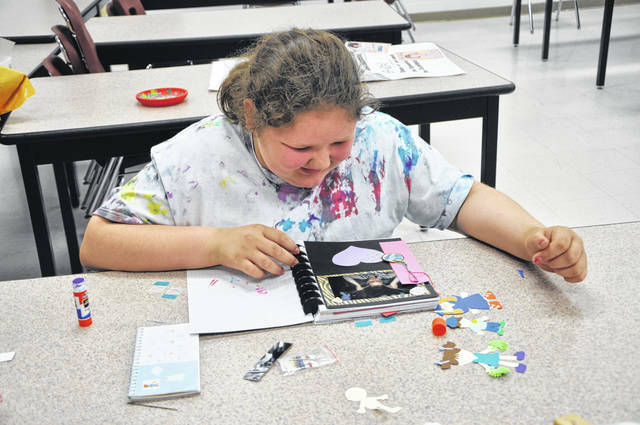 Jessica Huddleston looks at new pages of her scrapbook that she made this week in the scrapbooking 101 course during the academy. Huddleston has taken the course twice now and said she plans to continue scrapbooking. Students in the yoga course demonstrate their mastery of the “tree” pose Friday morning at Dempsey Middle School. Movie making, scrapbooking, yoga, art and edible science were just some of the courses offered this past week during the Dempsey Middle School Enrichment Academy. In the film and video course, Instructor Thomas Hering said students had to come up with a video idea, shoot and act in the video, edit the video, and premiere the video to their parents and fellow students. “The goal was to have them learn film production process from idea to premiere,” Hering said. Hering said the only limit on the student’s productions was that they had to make sense within the context of a school, since that’s where students would be filming. The films ranged in subject from a science experiment turning students into zombies to a story about a student trying to steal a test from his teacher to cheat and being caught. One pair of students, Carter Sharp and and Sam Bruskotter, seventh-graders, wrote and filmed a video called “The Yawn” about a student who yawns once and sees it spread to other people. Sharp said the punchline is that one person at the end doesn’t yawn and is told that psychopaths aren’t effected by other people’s yawns. Bruskotter said he had filmed some things before but had never used real video cameras or editing software. The students also acted in each other’s videos and got to find and edit in music for their projects. Hering said the students worked on the videos for a week, and the results were better than he hoped. 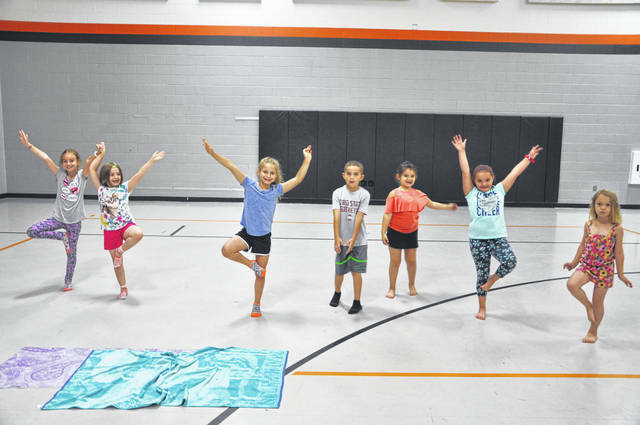 Elsewhere in Dempsey, the atmosphere was low key as instructor Sarah DeLong led students in a weeklong yoga course where students learned poses and techniques to relax. DeLong said students learned resting poses and some basic meditation and mindfulness. Bailey Cooper, a third-grade student in the course, said she signed up because she gets anxious sometimes and thought the course would help her overcome that. Her classmate, Sydney Lewis, a first-grader, said she did gymnastics and thought she could get better by learning some yoga techniques. Students in the scrapbooking 101 course committed memories to paper and worked on designing their own scrapbook pages with the help of instructor Megan Pollock. Pollock said students got to use a Cricket machine to make paper figures for the scrapbooks, made a bookmark, and learned how to use embellishments to make their pages more interesting. “I enjoyed it a lot!” Bullwinkle said. “I would do it again in the future.” She added that her favorite part of the week was making a paper doll of herself for the scrapbook. Jessica Huddleston took the scrapbooking course last year and signed up for a second time to gain more techniques and experience. The Summer Enrichment Camp was three hours each day with sessions in the morning and the afternoon. The camp concluded Friday.